RecipeTips.com's video demonstration, 'How to Make a Guard of Honor,' has easy-to-follow instructions to create the perfect Guard of Honor. Hi! This is Laurie from RecipeTips.com. Today I am going to show you how to make a guard of honor. I am going to show you the guard of honor using two racks of lamb. This can also be done with pork as well. Begin with two racks of lamb that have been Frenched. Stand both racks up on end, and you just want to interlock the bones so that they crisscross each other. Using standard kitchen twine, cut off enough that will go all the way around the rack. You want to tie a standard square knot between every second or third bone, so just slide twine underneath the rack of lamb, and then just use a square knot to tie it off. Then don't forget to trim your excess ends. Continue all the way down the rack. As you can see, the guard of honor is really easy to prepare and makes great presentation for any special occasion. This one is ready to roast. 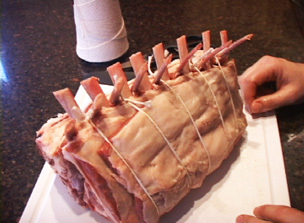 For more information on preparing lamb, visit RecipeTips.com.